Elsewhere, the party’s Ard Fheis in Killarney has heard speeches on the economy and emigration as it prepares to hear from president Gerry Adams later this evening. Martin McGuinness address delegates at the Sinn Féin Ard Fheis in Killarney, Co Kerry earlier today. THE DEPUTY FIRST Minister of Northern Ireland Martin McGuinness has offered to hold talks with dissident republicans during a speech at the Sinn Féin Ard Fheis in Killarney today. McGuinness, the party’s presidential candidate in last year’s election, said that “the war is over” and that his party was in the process of building a “new Republic” that dissidents can be part of. Speaking to delegates in Kerry this morning, he addressed the dissidents directly. “Today I want to send a message directly to them, I am offering them an opportunity to meet and talk, come and tell us what you hope to gain by deluding yourselves and the gullible that your actions will succeed in what is certainly a pathetic and futile attempt to turn back the clock,” he said. McGuinness said that recent attacks by dissidents on “vulnerable young people” needed to stop and insisted that he did not want to return the North to the violence and troubles of the past. “The war is over and we are in the process of building a new Republic and you can still be part of that,” he said to the dissident republicans. ”There is plenty of room within the political process for voices who oppose the Sinn Féin strategy. I was part of the conflict, I was there during the difficult and tragic times we had in the past and let me tell you there was nothing romantic about the war, it was hard, it was painful and it was traumatic and I never ever want the children of Ireland who live today in peace to be subjected to the conflict, pain and hurt that we lived through. 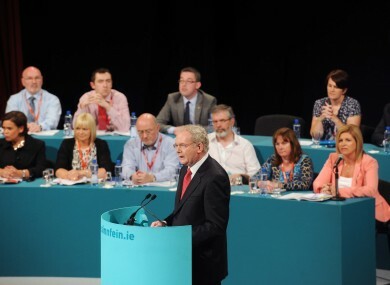 Elsewhere, speeches at the party’s Ard Fheis today have focused on the issue of the Irish economy today. Speeches later today will also focus on housing and healthcare. The party’s foreign affairs spokesperson Pádraig Mac Lochlainn said that the country is now back in recession and criticised the austerity policies of the government. He said: “It has been four years since Fianna Fail ran our economy into the ground. We have had five austerity budgets. A total of €24 billion has wrenched from the domestic economy in tax hikes and cuts to vital health, education and community services. “And where has this policy of austerity got us? The economy is now officially back in recession. The domestic economy has never been out of recession. Senator Kathryn Reilly highlighted the issue of emigration in her speech, pointing out the effect that it was having on GAA clubs around the country. Later this evening, the party’s president and leader in the Dáil, Gerry Adams, will address delegates in a speech to be broadcast live on RTÉ television from 5.20pm. He is expected to outline the party’s opposition to the Fiscal Compact treaty referendum next Thursday. Email “'The war is over': McGuinness offers to meet dissident republicans ”. Feedback on “'The war is over': McGuinness offers to meet dissident republicans ”.